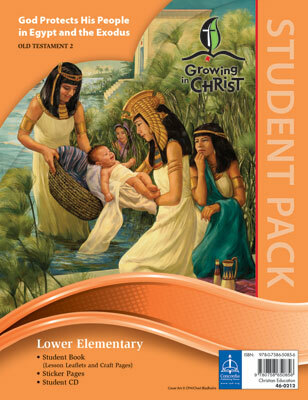 The Lower Elementary Student Pack, for 1st and 2nd grade, ages 6–8, includes a colorful lesson leaflet with craft pages, stickers, and a student CD with recorded hymns and songs. Great for in-class review and to take home to share Bible learning with the entire family. Growing in Christ is a Sunday School program for ages 2 to adult that takes students through the Bible in three years. It follows a same-age classroom model so students learn and grow in faith alongside their peers. Together, they explore the Bible, draw connections to the Small Catechism, and learn about the traditions of the Lutheran Church.